Venezuela’s dictatorship, economic crisis and insecurity has everyone fleeing even those not from that country. Cuban doctors sent to work to Venezuela by the Castro regime are leaving in record numbers. The rate of those seeking freedom in the U.S. doubled in 2013 for a total of 700 deserters, Rio de Janeiro’s daily O Globo reported (Nov 17, 2014). The newspaper cited information from the Miami-based Solidarity Across Borders (SAB), which advises physicians who try to settle in the U.S. The report further claims that 2,637 of the 5,000 people welcomed by the SAB are doctors who managed to escape from Cuba. SAB president Julio Cesar Alfonso is one of them. Aged 46, he has lived in the US since 2009 as a political refugee. According to Alfonso, the rate of Cuban defections is increasing worldwide. Between September 2013 and the same month of 2014 about 1,100 doctors sent by Havana to several countries left their miserable jobs. But nowhere is the situation is as bad as in Venezuela’s so-called Bolivarian regime imposed by the late dictator Chavez. 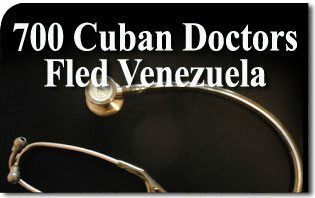 “By 2013 the annual average of defections in Venezuela, where about 30,000 Cuban doctors operate, was 300. “But the lack of financial, economic and political stability, especially after Chavez’s death, drove Cuban doctors away from the country,” Alfonso said in a phone interview with O Globo.